MULTI HEAD COMBINATION WEIGHER High Speed & High Precision weighing is the uniqueness of multihead weigh filler. UNIQUE series is well known for its pouch finish & sealing intactness which prevents leakage of inert gas from pouches & gives extended product shelf life. Power Requirement 420V. AC Three Phase, 50Hz. APPLICATIONS:-Highly Suitable for :- Snacks, Kurkure and Potato Chips, Farsan, Chiwda, Namkeen, Dry - Fruits, Pulses, Grains, Tea, Sugar, Seeds, Frozen cut vegetable etc. 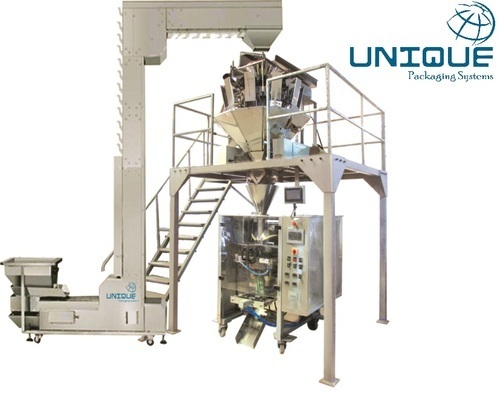 Unique Packaging Systems, an (Aggarwal group) is engaged in manufacturing, wholesaling, and exporting of Automatic Filling and Packaging Machines that are masterpieces of engineering and fabricated with great attention to accuracy and precision. Our line-up of automatic packing machines include Automatic Filling and Pouch Packaging Machine, Semi-Automatic Pouch Packaging Machine, Automatic Liquid Fill and Seal Machine, Automatic and Semi-Automatic Auger Filling Machine for Powder, Automatic FFS Machine intermittent type, Automatic Horizontal Flow Wrap Machine, Shrink Wrapping Machine, Powder Mass Mixer, Paste Filling and Packaging Machine, Semi-Automatic Volumetric Cup Filler, Continuous Bag Sealing Machine and Semi-Automatic Twin Head Liquid Filling Machine. We offer a complete solution for various packaging requirements. Our uniqueness lies in our innovation and quality orientation. The profound infrastructure that we have facilitates us in meeting the entire product requirements timely and effectively. It also facilitates us to provide customization to our complete range of products. We believe in maintaining our long-standing ethical business values and imparting effective services to our clients. We aim to develop the long-term business relationship with our clients on the principle of mutual growth. With a focus on growth, we also lay emphasis in providing quality products at the most competitive prices. We also ensure to furnish products within the scheduled time frame. We offer our range of packaging machines in different models and specifications. Our products are high-performing and durable. Our exclusive designing along with modern processing provides easy handling and reliable utilization of our products. We are looking bulk inquiries from Mumbai, Chennai, Kolkata, Bangaluru, Ahmadabad, Hyderabad, Lucknow, Kanpur, Varanasi, Jaipur, Jodhpur, Ajmer, Bikaner, Kota, Udaipur, Bhilwara, Alwar, Agra, Meerut, Aligarh, Allahabad, Banaras, Mathura, Jhansi, Ghaziabad, Noida, Bareilly, Moradabad, Saharanpur, Uttar Pradesh, Punjab, Chandigarh, Jalandhar, Amritsar, Ludhiana, Bathinda, Pathankot, Patiala, Hoshiarpur, Himachal Pradesh, HP, UP, MP, Shimla, Dharamshala, Uttrakhand, Dehradun, Haridwar, Roorkee, Rudrapur, Rishikesh, Nainital, Udham Singh Nagar, Indore, Bhopal, Jabalpur, Gwalior, Ujjain, Sagar, Ratlam, Satna, Dewas, Gujrat, Surat, Vadodara, Rajkot, Bhavnagar, Jamnagar, Gandhinagar, Karnataka, Davanagere, Belgaum, Hubli, Chitradurga, Tamilnadu, Coimbatore, Madurai, Salem, Trichy, Tiruppur, Erode, Vellore, Kerela, Kochi, Thiruvananthapuram, Kozhikode, AP, Andhra Pradesh, Visakhapatnam, Vijayawada, Warangal, Guntur, Nellore, West Bengal, Asansol, Siliguri, Durgapur, Bardhaman, Bihar, Patna, Gaya, Bhagalpur, Muzaffarpur, Jharkhand, Jamshedpur, Dhanbad, Ranchi, Assam, Guwahati, Agartala, Shillong, Haryana, Karnal, Ambala, Panipat, Rohtak, Hisar, Faridabad, Gurgaon, Maharashtra, Pune, Nagpur, Thane, Nasik, Aurangabad, Rajasthan, Goa, Jammu, Srinagar, J&K, Chhattisgarh, Raipur, Bhilai, Bilaspur, Korba, Odisha, Bhubaneswar, Cuttack, Rourkela, Navi Mumbai, Virar, Kalyan, Bhiwandi, Puducherry and all over India.